Leaf cutter ants, like the species Atta columbica from Central America, live in colonies of several million individuals. These ants farm a particular fungus species in their nests, and feed from the fruiting bodies of the fungus. In order to feed the fungus (which, of course, is itself heterotrophic) they cut pieces of leaves from nearby vegetation and return the pieces to their nest. 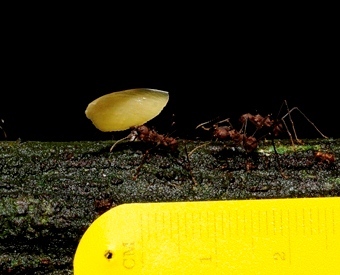 Like many social insects, they have distinct castes that divide the labor of the collective society: recon ants scout for new leaf sources and establish trails, foragers cut leaves and bring them to the nest, farmers tend the fungus, nursery ants care for larvae, and the queen takes care of the reproduction. 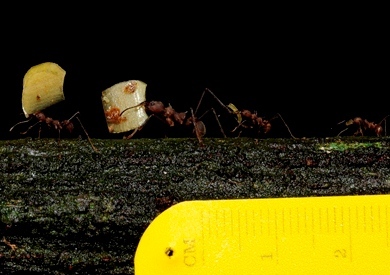 Watch this video of ants foraging in a forest in Panama. Wow! As you can probably now imagine, leaf cutter ants can defoliate a tree in a very short time, and can be significant agricultural pests on tropical farms. 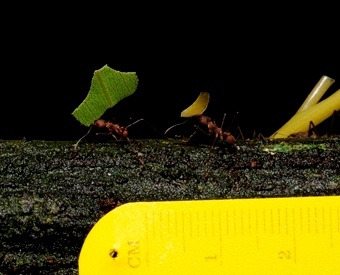 Because of their importance to forest ecosystems, to agriculture, and because they are common and conspicuous members of tropical ecosystems, leaf cutter ants have been studied quite a bit. 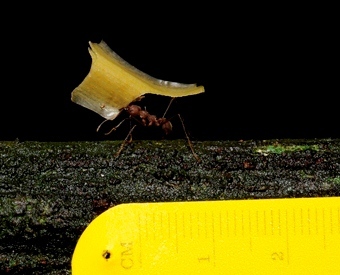 One of the most amazing things scientists have learned about leaf cutter ants is how they maintain the purity of the fungal colony growing in their nest. They have mutualistic bacteria which the ants tend and promote, and the bacteria themselves have anti-microbial properties. Simply put, to keep bad bacteria from taking over their hot, moist, resource-rich nests they tend "good" bacteria. 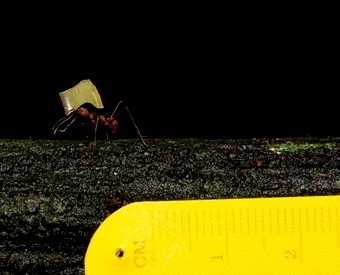 Despite the long history of research on these ants, there are many questions remaining to be answered. For example, how do the ants choose which species of plant to forage on? You saw in the video that the ants will walk great distances through the forest, passing by thousand of individual plants and dozens and dozens of other species to feed on a particular tree. Then suddenly, after several days of feeding, they will switch to a new species. 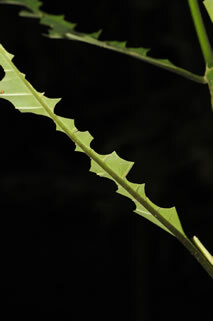 We know that the chemical defenses plants incorporate into their leaves deter ants (and many other species) from feeding, and new leaves are often less well defended. But in the green sea of leaves that is a tropical forest, how do ants, with individual brains the size of a grain of sand, survey what foods are available and decide on which to forage on? 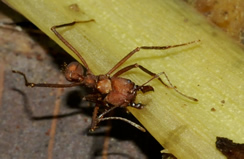 Examine the sample pictures and video below, while considering what you might be able to learn about leaf cutter ant foraging from a larger collection of similar images. In particular, note that photos were taken during three time intervals (10-11am, 12-1pm, and 3pm-4pm). Videos of the individual ants in the still photos were taken that captured that particular ant running a course of known length. Using image analysis software, we can measure any 1-D or 2-D dimension of the ants morphology (body length, leg length, head area) or of the leaves they carry (leaf area). We could count the number of ants moving in each direction, or we could note how many are carrying something vs. how many are empty-handed. We could measure the ants running speed. What hypotheses can we address with this kind of data?